Animated exploration of the life and controversial death of Vincent van Gogh. Loving Vincent is a crazy labour of love, exemplifying the idea that there is a little madness in all works of art. The film is a Polish-U.K. collaboration, which has resulted in an ambitious animated biopic celebrating the art of Vincent van Gogh. One must bow to the dedication of Dorota Kobiela and Hugh Welchman, the team behind this project. The production required the work of 125 painting animators to create 65,000 oil-painted frames incorporating 120 of van Gogh’s most famous paintings - a process that took 10 years to complete. Striking, lush and the most tactile looking piece of cinema I have ever seen - the viewer is almost tempted to reach out and touch the onscreen brush strokes, to feel the texture and oiliness of the paint. Even those who do not profess to be art lovers are familiar with van Gogh, the tormented 19th-century Dutch painter. A social misfit prone to bouts of depression, he would dedicate the last decade of his 37 years to painting, disregarding the material and emotional cost. The result was over 800 oil paintings that engaged the emotions and captured the visual imagination in a way that continues to resonate with people today. Van Gogh absorbed the essence of Impressionism and re-worked it into his own trademark vision of glowing colour and passionate, kinetic brushstrokes. His technique gave a hitherto unseen vibrancy to depictions of the French countryside and his portraits of people, which are reproduced during the film. Loving Vincent is touted as the first-ever fully-painted feature film. If you ever imagined van Gogh’s paintings coming to life - this is how it might look. It is indeed mesmerising to witness van Gogh’s familiar starry, starry sky radiating in night scenes - stunning to see waters undulate with shimmering waves, wheat fields ripple in yellow and orange, and rainstorms descend like a deluge of grey, rectangular confetti. Although beautiful to look at, the effect can be overwhelming. The flashback sequences rendered in black and white do offer some relief from an otherwise intensely colour-soaked visual rush. However, the moving image is a different medium, one not solely dependent on beautiful pictures. 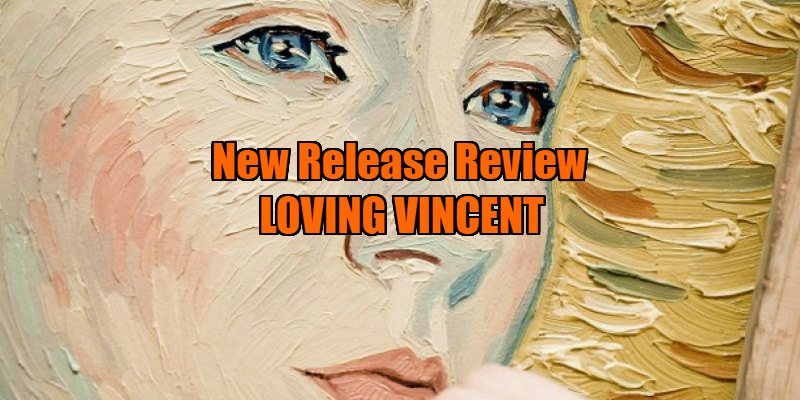 Loving Vincent also attempts to offer a story, a murder mystery which probes whether van Gogh committed suicide (in 1890) or was protecting someone else who was the actual shooter. The storyline integrates van Gogh’s portraits and landscapes with hand-painted live-action footage of actors. Assuming the role of narrator is Armand Roulin (Douglas Booth), a young man in a vibrant, yellow jacket who, a year after the artist’s death, is reluctantly tasked by his postmaster father (Chris O’Dowd) with the job of delivering the last letter Vincent (Polish theatre actor, Robert Gulaczyk) wrote to his beloved brother Theo (Cezary Lukaszewicz). Unable to deliver the letter to Theo, who he discovers has also died, Armand begins to interrogate those who knew Vincent during his last six weeks, trying to judge who might be the best person to receive Vincent’s last written communication. He speaks to a wide cast of characters that includes van Gogh’s paint supplier, his doctor and his landlord, but each witness offers a divergent opinion of the artist before he died. His search includes an innkeeper’s amiable daughter, Adeline Ravoux, (delightfully played by Eleanor Tomlinson), who has cordial memories about Vincent’s time as a resident, and the less-charitable Louise Chevalier (Helen McCrory), religious bigot and housekeeper to Dr. Gachet (Jerome Flynn), Vincent’s physician and friend. Armand is led to the boatman (Aidan Turner), who indicates Vincent’s friendship with Gachet’s daughter, Marguerite (Saoirse Ronan), and hints at a possible romantic connection, but Marguerite is evasive regarding his questions. Aspects of Vincent’s supposed suicide do not add up - the fact that the bullet came from an odd angle and that the gun was never found. Ultimately, viewers are left to form their own conclusions about what might have happened. The pacing is rather uneven, reflecting an awkward back-and-forth between murder investigation and biopic conventions. However, the primary achievement of Loving Vincent isn’t the story but the art - this film is all about style and less about substance. The result is often breath-taking, and takes the phrase “every frame a painting” literally. Underpinning the melancholy mood is a sweetly fluid score by Clint Mansell, using strings and piano. 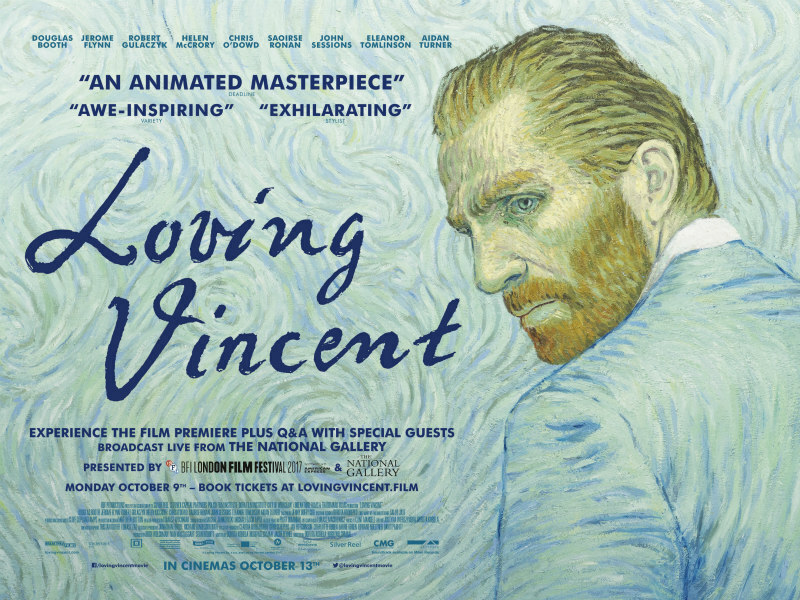 The title Loving Vincent is ostensibly a reference to how van Gogh ended his letters with the phrase: “Your Loving Vincent.” However, it also refers to the fact that this is a film about the people who loved Vincent van Gogh in life, and grieved his death, as well as the artists who still love and respect his achievements today. Loving Vincent is in UK/ROI cinemas now.